Students and Seniors, or Tax Cuts for the Rich? This Shouldn’t Be a Tough Choice. By Scott Moore of Portland, Oregon. Scott is the Communications Director for Our Oregon and was a political reporter and news editor for the Portland Mercury. This may come as a surprise, but on January 1 the richest 2% in Oregon got a tax cut that will cost the state $118 million this year alone. Happy New Year (if you’re rich)! When the legislature meets for a special session in February, the first and easiest decision lawmakers can make is to reverse the tax cuts for the rich that went into effect on January 1 when Measure 66 largely expired. Restoring the M66 marginal tax rates for the richest 2% would save more than $350 million over the next three years. That’s money that could save the jobs of thousands of teachers, reduce class sizes, and protect in-home care for thousands of low-income seniors. Click here to sign a petition urging the legislature to roll back these tax cuts for the rich. Or legislators can protect the rich at the expense of middle-class families. They can sit back and allow a tax cut for the rich to go through without a fight, all while they make deeper cuts to education, health care, and public safety. Somehow, I don’t think that’s what a wide majority of voters had in mind when they voted on Measures 66 & 67. Why are these measures expiring? Well, when the legislation was being written that led to Measures 66 & 67, legislators made them largely temporary at the insistence of corporate lobbyists. Those same lobbyists still turned around and opposed the measures anyway, spending millions on ads calling them “permanent.” Making the measures temporary was bad policy and bad politics then, and it still is. It’s time for legislators to stand up for the needs of their constituents, not corporate special interest lobbyists. Restoring the M66 tax rates will also help narrow the widening income gap between the top 1% and everyone else. 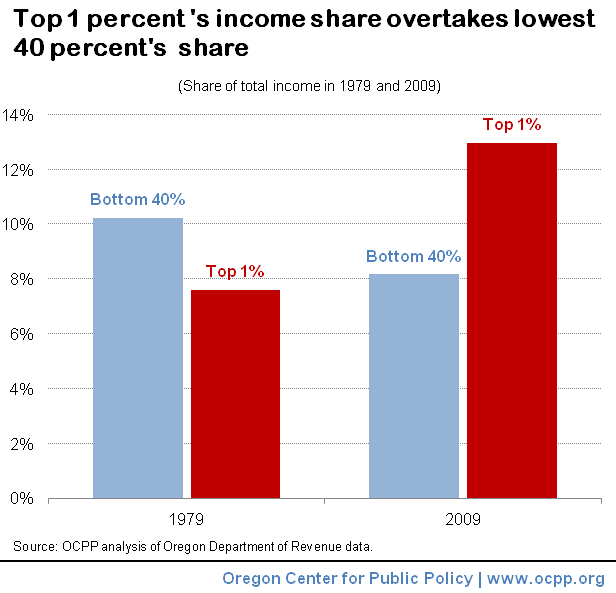 In Oregon, the past 30 years have seen more and more wealth concentrated at the top, while income for middle-class and low-income families has fallen. Allowing the tax cuts for the rich to go through will only make this problem worse. What can you do? Sign our online petition calling on the Governor and Legislators to reverse the tax cuts for the top 2%, and start investing in Oregon’s middle-class priorities, like our schools and care for low-income seniors. I can't see restoring the M66 marginal tax rates without a vote of the people again. Can you? I voted for M66 last time and could support it again. However, I am sensitive to what happens on the spending side. If the legislature funds the Columbia River Crossing project, I become a "no" vote. And if Portland Public Schools and the State of Oregon continue not to fund sending high school students (just five would do as a pilot) for school year in China, I am again a "no" vote and will probably campaign against it..
David, we have a different sense of proportion here. If you are willing to hold seniors and disabled people facing horrible, life-threatening and life-altering cuts hostage to your Mandarin agenda, you profoundly alienate me from any ability to consider working with you for Mandarin, even though I support it in principle. IMO you need to be looking for allies but instead are making potential allies think that they have would have to adopt your extreme single issue views to be able to work with you. Please rethink your approach for the good of your cause. Unfortunately, this legislature will likely cut another $118 rather than raise any tax. If they take it from school funding, $118 is about 6 days of k-12 education, or bigger classes, or higher tuition. Rather than extend Measure 66 they could increase our nearly-lowest-in-the-nation beer tax or stop giving seniors a tax break just because we're seniors, whether we need it or not. But I fear we face an all-cuts budget this year, rather than something bold as Scott suggests. There are truly horrendous cuts coming down the pike in the Oregon Health Plan and especially for dually eligible (Medicaid and Medicare) seniors, as well as the potential for nasty cannibalistic politics that pit seniors and the disabled against school kids -- not to mention ever-increasing higher ed costs and debt for our rising generation of young adults.